Nothing is more relaxing than coming home to a beautifully smelling home. Whether you are an individual that loves spicy scents, relaxing scents, or fresh scents, the right candle can enhance your mood, liven your spirit, and make your home smell beautiful. With that in mind, as one of the first articles of our home section, we are eager to share the best ten candles that an individual can buy today. As candle enthusiasts ourselves, this was particularly exciting to write about because we got to not only learn new candle scents, we are sharing them with you. As you scroll below and read, you will find a wide variety of candle scents that all deliver a beautiful smelling candle. More so, one area of focus that we touched upon is the safety of the candle and how strong the scent is because no individual wants a bad and weak smelling candle. With that said, let’s talk about the first candle on this list, one of the best candles an individual can buy today! At the pinnacle of the candle market, we have the wildly popular, Our Own Candle Company, standing proud and tall with their Smell My Nuts candle. What makes this product such an appealing candle to consumers is not only it’s pun-of-a-name, but also the impressive price tag, burn time, and, we can’t forget it – the scent! Whether you re in the mood for hazelnut, banana nut bread, or even toasted coconut, this candle is for you! We have all purchased a candle before that, after only a dozen hours, all the wax is gone. It’s probably the biggest letdown to a candle lover, especially if the candle smells good. Now, in order to combat that this problem, this manufacturer utilized a specialized blend of waxes to provide consumers with over 100 hours of burn time. As you will learn in this buying guide, that’s kind of rare, hence why this is leading the pack! If you are a frequent candle buyer, you know that these little smelly goods can be quite costly. Now, as candle burners and lovers, you can imagine the surprise on our faces when we first got a glimpse at the price tag of this candle. Not only is this the cheapest candle – it’s the highest rated and most preferred candle because of the value and quality of the burn. The best part is after the candle is done the burning, you have a mason jar that you can use for DIY projects. Consumers have the option to purchase in a single pack or a three-pack, at a discounted price tag. The wax used to make this candle is a special blend of both soy and paraffin. Candle burner will appreciate knowing they can get over 100 hours of burn time with this candle. The blend of nuts in this candle is a great scent for any home and any room that needs some rich aromas. Consumers will not find a candle with the same value at this price tag. Some consumers have complained that this candle does not smell strong in larger rooms. Frequent candle burners have noticed that the candle does not burn the whole way through. If there is one brand and candle that is on the rise, it’s the Wax and Oils Scented Candle Soy Wax Aromatherapy line-up. This company has built a reputation on offering a wide variety of scents, stellar packaging, and a long-lasting aroma. So, whether you are looking for lemongrass, orange, or even some cucumber melon, this might just be the scented candle for you! When evaluating this brand, what took us by surprise was the vast amount of candle scents for consumers to pick from. Now, in order to make purchasing your next candle easy, this brand also offers different packages and mixtures so that you can get your favorite candles in a 3-pack. For us, our favorite has to be the lavender candle. It’s strong, rich, and has a lingering scent that can last for days. Out of the many different candles that consumers can pick from today, this brand and their candles are probably one of the strongest scents and aromas out there. While each candle only comes with a 24-hour burn time, each second and minute is praise-worthy. Additionally, when you consider that each candle is made from high-quality wax and there are no other ingredients, you know that this candle is of the highest-tier. When it comes to looking at the cost of candles, this product and brand are actually one of the cheaper products on the market. However, you should not assume that just because a candle is cheap the scent and quality of the candle are lacking. Any scent offered by this company is arguably the best in the industry, proving its value. 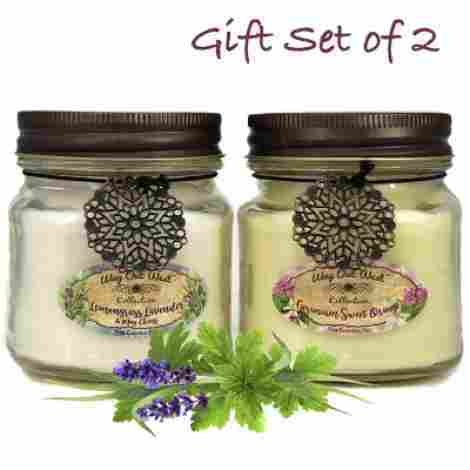 Consumers have the option to choose from a wide variety of candle scents, not just lavender. Each candle is made from the highest-quality wax and has no other ingredients. Each product has a burn time of up to 24 hours, considering how strong the burning scent is, this is great. This candle is made in the United States of America. Consumers can also choose to buy this candle in bundles or packages. Candle lovers have complained that the burn time is too short in comparison to competitors. The scent may be overpowering for some individuals, depending on the room and square feet. At this point, we have not really explored any higher-end, luxury candles, until this product. The Trapp Signature Home Collection No. 13 Bob’s Flower-scented candles are considered one of the most expensive candles on the market; however, there is a distinct difference between this product, and many other candles on our list today. With two different sizes and a few scent options, let’s see what makes this product worth your consideration. When it comes to purchasing candles, it can be challenging to know whether a candle can help provide the scent for a room, especially when they only come in one size. Luckily, this brand helps to combat this by offering their scents in two different sizes, 2-ounce Votive candles and a 7-ounce poured candle. Now, what makes this such a valuable consideration is that consumers have the option to choose from three different fragrances, all of which are positively praised and touted by other customers. Whether you are in the mood for Melange of Fresh Floral, Aqueous Notes, or even Cut Green Stems, this company has you covered. The best part about this is that each purchase is stunningly packaged in a little gold house, also making this a great gift idea. As we said above, this candle is one of the most expensive products that we are going to share with you today. In fact, when it comes to the market of candles, this brand and product candle experts might consider this product to be the entry-level into the luxury market, comparing it to larger, more costly brands. With that being said, this company is more interested in the value they are offering, rather than the price tag. So, with a burn time of over 50 hours, stunning packaging, and a great scent, this candle is easily one of the best of the best. Out of the competition, this brand does the best job at packaging their products, making consumers feel special and proud of their purchase. Consumers will have the option to choose between three different, high-quality scents. There are two different sizes for consumers to pick from, 2-ounces and 7-ounces, depending on their need. All candles offered from this company will come with at least a 50-hour burn time. Some consumers have complained that the scent and fragrance are too strong. This product may release black soot and more smoke than other candles. If you are an avid candle buyer or consumer, then you have heard of the infamous brand, Bath, and Body Works. This company has risen to the top of the market and industry, releasing some of the best candles that consumers have ever burned. You might be wondering, what candle is the best from this brand? 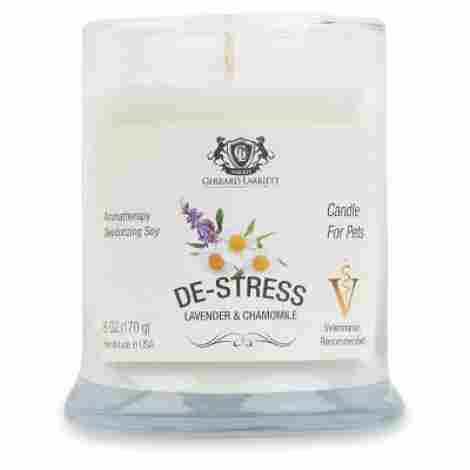 Well, it’s all about the Aromatherapy collection; more specifically, the Stress Relief Candle. When it comes to this brand, you should know that each candle is made from their own, highly-proprietary wax and wick blend. Each candle is made from a unique vegetable blend of materials, allowing the candle to be more organic and natural when burning. Additionally, this helps to produce an even stronger scent, which we are about to talk about in the next section. If you have ever burned a candle from this brand, you know that their products almost always smell amazing. 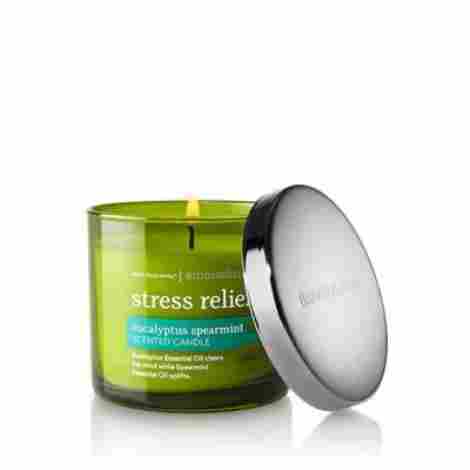 The Stress Relief, Eucalyptus Spearmint candle is no exception. In fact, this candles scent has been said to be so strong that some consumers only need to burn this for 30 minutes before turning it off. So, if you are looking to make your home a little bit more zen, this candle can do it quickly. When it comes to comparing the cost of this candle to others on our list today, this is considered slightly higher priced than most of the competition. Now, this should not deter anyone from purchasing this product. The truth is, the price tag behind this product is fair considering the amount of value and the company that made it. This product is made from one of the most popular makers of candles in the industry today. The candle can last up to 45 hours of burning. Thanks to the vegetable-based wick and wax, this candle offers a very powerful aroma. The scent is was intently made to help individuals relax thanks to the use of essential oils. Candle lovers have complained that this product is overwhelming, making it difficult to burn for long periods of times. The burn-time of this candle is slightly lower than competitors. For all the candle lovers out there, we finally reached the company that you were probably looking for. Yankee Candle is easily one of the largest providers and manufacturers of candles in the world. So, it should not be a surprise that one of their very own products made our list. Now, while it might not be the holidays just yet, it’s always a great time to burn Yankee Candle’s Balsam and Cedar. Are you ready for a shocking highlight? This individual candle, in its large size, has the capacity to burn up to 150-hours, if done properly. Now, if you are curious this means properly cutting the wick, shutting the candle off the right way, and burning it for the appropriate amount of time. So, if you are looking for a candle that you can burn for 6 days – this is it! 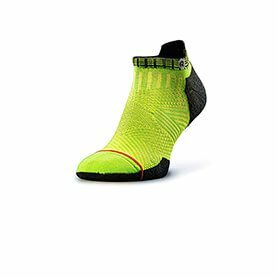 Our opinion, what makes this product such a valuable consideration is that you can purchase it multiple sizes. Whether you are looking to bring the holidays with you in the car or in a small, medium, large, or multiple wick candles, this brand has endless options for you. Additionally, users have the option to purchase a gift set version of this candle, should they be planning ahead for the holidays. Now, as you might assume since this company is the leading provider of candles, their prices are considered more expensive than many other competitors. However, given that this company is essentially the guru of candles, you can anticipate that any product you purchase from them is of the highest-quality. In other words, the price tag for this product really does line-up with the value. Consumers have the option to purchase this candle scent in a wide variety of sizes and scent styles, including candles, gift sets, and even a flameless version of it. The maker of this product is one of the largest and most well-known makers of candles in the world. The candle itself offers a strong woodsy scent, creating a festive, holiday scent in a room. This product can last up to 150-hours when burning, which is over 6 days. Consumers have complained that this brand has reduced the quality of the oils in the candles. When it comes to decorating, nothing says ‘welcome into my home’ like freshly lit beautiful candles. Other than that, candles around the home can add to the arrangements of the house, the décor, and make the home feel more relaxed and happy. With that said, we are eager to share the Hosley Set of 48 Unscented Clear Glass candles for individuals that want beautiful and simple décor and may be allergic to specific scents or odors. When it comes to a candle, the quality is detrimental. A cheap burning candle can lead to an odd and smelly odor, won’t last nearly as long as a quality candle, will not burn properly and may cause a lot of smoke. With that said, individuals can expect that these candles are of the best quality. In fact, they are hand poured, all 48 of them. They are also wax candles, so they have a long burn time and burn really evenly. With that in mind, the quality is superb leaving no discolored residue. When it comes to quality candles, these are one of the best in the industry. In fact, the burn time of these candles is one of the best out there for monitor votive candles. Votive candles are known to only last a couple of hours. Therefore, we were impressed that the burn time is up to twelve hours per candle. Individuals can easily a enjoy an evening in with a beautiful set of candles around the house. When it comes to the cost and value of this item, we can guarantee that it is of the best quality. For 48 unscented clear glass candles, we were incredibly impressed by the quality of the candles alongside the amount that the brands include the price. With that said, we can say that they are perfectly priced for everyday use and will add a lot of appeal to an individual’s home. Set of 48 candles that are of the best quality. Designed with a white color wax that loos beautiful when burning. High quality product that users have come to know from this brand. Properly packaged product and designed for consumers. Well designed aromatherapy candle that is great as a gift. Not as big as the photo suggests. If you are an individual looking for one of the best quality candles available today whether for yourself or a gift. We are eager to share the Gerrard Larriet Aromatherapy candle, a quality candle meant for stress relief and safe enough for pets. This is one of the best smelling candles available today and individuals will want to collect them all. Let’s take features into consideration. When it comes to a candle, the jar has to be of the best quality. If not, users run the risk of breaking the jar or the jar not being able to withstand the heat. Other than that, nothing is better than a reusable jar that an individual can find a purpose for. With that in mind, this particular jar is an apothecary jar that is reusable and perfect as added décor around the house. This brand is one of the best brands in the industry today for their attention to detail. If you are a candle burner that wants a quality candle that smells beautiful and is safe enough for pets, we highly recommend this brand. 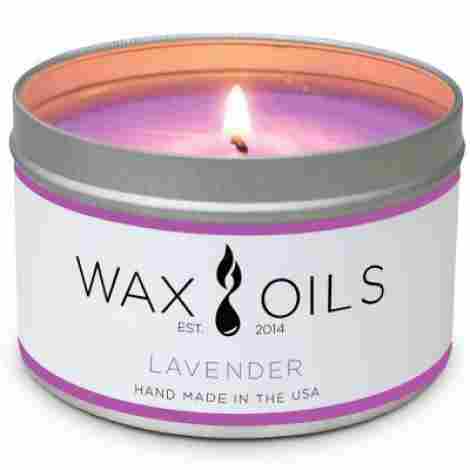 With that said, the candle is handmade in the USA and includes 100% natural soy wax that is also dye-free. With that in mind, the brand itself includes a gift box with every purchase. As we take cost and value into consideration for this particular candle, we can say that it is one of the best-priced candles in the industry today for the quality. Now, the size is not as large as one would think, but considering that it is 100% soy wax, individuals should expect it to have a long burn time. In fact, the burn time for this candle is up to 40 hours. For the price, we highly recommend them. However, there are a total of seventeen different scents, which can get costly if you buy them all. Beautifully smelling candle that can withstand the test of time. Clients say that this is one of the best candles available today. Forty-hour burn time is of the best quality. Looks beautiful even as décor. Designed exquisitely and made in the USA. Comes with a gift box included in the purchase. Trustworthy brand with years of experience. Not as large as one would expect. When it comes to a brand that has expertly designed a candle with quality and presence, this one excels. This next candle is not only exquisitely designed, it also boasts one of the best scents in the candle industry today. The candle itself is designed as the perfect everyday candle for individuals that want a beautiful decorative candle with a luxury scent. Let’s talk about the Way Out West Aromatherapy Essential Oil Candle. For the price, individuals can expect a set of two. With that said, the scent is properly executed and smells amazing for individuals that want a fresh scent in their home. With that in mind, we can say that this is one of the best smelling candles available today and the set comes beautifully adorned and style. Here are two examples of the different sets an individual can expect. The sets are Sweet Orange and Lemongrass, Sangria and Spicy Pumpkin, and Field of Lavender with Eucalyptus Mint. With that in mind, always check back for different scents and available options. No candle is properly designed without a great and long-lasting burn time. With that said, we can say that the burn time of this candle is one of the best going up to 40 hours per candle, 80 hours total. With that in mind, individuals can expect that the candle will be able to stay lit and burn properly. The burn time is one of the best for an eight-ounce candle. Other than that, the wick is designed so a mushroom head does not form, eliminating extra soot. As we take cost and value into consideration, we can say that this is one of the best candles in the industry today. The candle itself is designed with a very pretty and cute label that makes it perfect as a gift or ideal for décor around the house. With that said, for a set of two individuals can expect to pay the same price as they would for one regular medium size candle on this list. For the décor, size, burn time, and quality scent, we highly recommend it. Great gift for individuals that love to burn candle. Beautiful candle scent smell that can last up to forty hours. The wick is designed to not leave a mushroom head. Trusted brand that is made in the United States. Perfectly designed candle for birthdays, anniversaries, and more. Consumers have the option to pick from two different scents. The wick may fall into the wax at times. As one of the best candles that we can share with our audience, we are eager to talk about one of the most luxurious candles that an individual can buy. Resembling a Jo Malone style, without the price tag, this is the La Jolie Muse scented candle that is perfect for a romantic night in or a beautiful gift for any individual. Here are two points to take into consideration about this particular candle scent. This next brand is known as one of the top-quality brands in the industry today. This particular brand focuses on quality alongside stylistic design. Each of the candle jars is beautifully adorned with some kind of design that makes them perfect for décor. Other than that, the brand has a natural cotton wick and the wax is 100% soy that is non-GMO grain and strictly limited to any additives. With that said, the packaging is also recyclable, adding to this brand’s mission of supply earth-friendly quality. Many individuals have mentioned that the scents of this particular brand are beautiful smelling and add a level of quality to the air in the home. The scents are eco-friendly and 100% soy wax so they are designed to last a long time, roughly 50-60 hours, which is shocking. With that said, individuals can expect that the candle will burn evenly and offer a strong scent in the home. As we take cost and value into consideration for this particular item, we can say that the scent of this particular brand is one of the best in the industry. Now, the price is slightly above candles that are priced the same. However, for the scent, individuals can expect one of the most delicious smelling candles for the price. With three scents to choose from, they are a perfect gift for any person. Beautiful design and label that comes in a gift box. Eco-friendly wax that is 100% soy. Made from a biodegradable and pure soy wax material. Long lasting burn time of about 65 hours. 100% satisfaction guarantee with a full refund option. Three different available scents and options. Individuals have mentioned that the scent can be extremely strong for a small home. 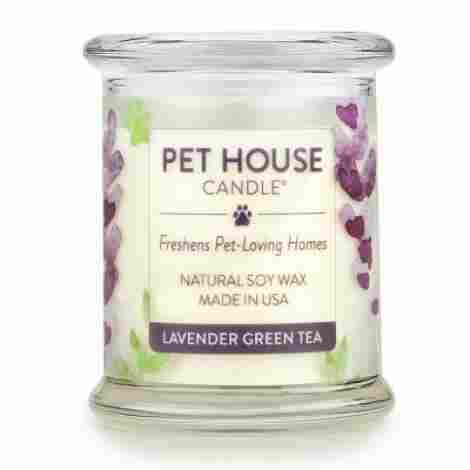 As the last candle on this list, we are eager to share the Pet House One Fur All brand. This brand is designed with one of the best materials in the candle industry and better yet, it is safe enough for pets of all sizes. With that said, let’s look at two important things to consider about this brand if you have pets or are wanting to give it to a pet lover. When it comes to quality scents and plenty of options, this brand has it all. In fact, this particular brand has plenty of quality scents that individuals will enjoy. In fact, the scents range from Apple Cider to Vanilla and other delicious scents. Now, the fragrances are only of the highest quality essential oils that are also very safe for pets and humans. Each pet odor candle provides a beautifully smelling aroma that will last for days without end. When it comes to brands that really care about our furry friends, we can say that this is one of the best. In fact, their candles are 100% soy wax with a cotton wick. They are also 100% paraffin, allergen, and dye-free which allows for a cleaner overall burn around the house. Better than that, they do not produce any soot or smoke, leaving a cleaner scent. As we take cost and value into consideration, we can say that this brand is one of the best in the industry for individuals that want quality and a candle safe for pets. The brand has been highly known to produce some of the best scents and users can expect to pay a bit above average for the candle due to the chemical-free soy that is safe for pets and humans. With that said, we highly recommend them for the pet lover that wants a beautiful smelling home with the security that their pet is enjoying it too. Effectively fight odors and leave your home smelling fresh. Fresh and welcoming fragrance that smells delicious. 15 different scents to enjoy. Quality produce that is handmade and produced in the United States. Burn time of 60-70 hours. Now that you have learned about the top ten best candle brands that you can buy for your home today, don’t you just want to collect them all? These candles are all expertly designed with quality in mind and individuals can expect that the candles will be able to smell your whole home. With that said, which one did you pick? Did you pick it as a gift for yourself, or for others? Let us know what you think! With that said, we want to move towards another aspect of our articles, one of the fan-favorite aspects that we always tend to share, the Criteria and FAQ portion of the article. With this, we seek to answer the many questions that individuals are asking as well as guide our readers to a better way of selecting quality products such as candles. We hope you have found your favorite candle on this list and we are more than sure that individuals will love all of the scents. Let’s talk about the criteria and how we came up with the top ten best candles. As the next aspect of our article, we are eager to share the criteria that we used to evaluate the best candles. We do not consider ourselves specialized in the candle industry. However, we sure are fans of deliciously smelling candles. Therefore, we were extremely excited to be talking about this specific topic. With that said, how do you evaluate a candle? We asked ourselves this question repeatedly and although a candle seems like a simple topic to talk about, we really took into consideration individual’s concerns when it comes to the candle industry. With that in mind, we spent a lot of time testing and talking about what individuals care about the most when it comes to having a quality candle. This is what we discovered, many individuals want the overall package to be of the best quality with the candle smelling strong and being safe for humans and pets. However, this is considered a pricier candle to buy. Not anymore! Today, we shared with you some of the best candles that an individual can buy within a specific budget. This is how we picked and evaluated the top ten. Let’s begin with the overall quality of the candle! When it comes to the quality of the candle there are two rules that are true when choosing the right candle. Rule number one is that an individual can tell if a candle is a good quality based on the packaging alone. Rule number two is that individuals can tell if the candle is of good quality is the price tends to be a bit high. These are known as rules of thumb! Now, why are more quality candles more expensive? The primary reason is that candles that are of the best quality tend to have a stronger and more potent oil consistency. Meaning, the candle has more of the scented oil in the wax to produce an extremely strong smell. With that in mind, our goal was to find the best quality candles in the industry that have a strong and powerful odor but are priced really well. In this process of coming up with the criteria, another important element we took into consideration is the wax material and how the candle burns. As one of the top criteria to take into consideration, the wax material was very important when coming up with the top ten best list. Depending on the wax that a candle company uses, will determine the burn time, the consistency, how well it burns, and odor strength. With this in mind, we discovered that many different brands offer many different wax materials. Now, the most common wax materials are paraffin, beeswax, vegetable wax, and gels. However, there is a new wax material that has been taking the 21st century by storm an that is soy wax. Soy wax is known as one of the most durable, high strength wax while also being soft to the touch wax that does not produce a strong odor and is safe to burn. With that in mind, the wax that the candle is made from will also determine the burn time of the candle. Other factors that determine the burn time of the candle include the size of the candle and how many wicks are in it. For example, a candle with three wicks will burn a lot quicker than a candle for the size with only one wick. Another reason we took material into consideration is that more modern-day brands that produce quality candles are making them safe for pets and children. Meaning, most candles today are made free from paraffin, allergens, and dye free. With this, individuals can expect that their candles are going to be of the best quality and of the strongest and most beautiful scent. Now, most of the brands that we included on this list are free from all of the harmful substances that some candles have that make it unsafe for kids and dogs. So, users can expect that all of the candles are healthy and designed for a strong aroma that can last for days. Now, one of the most important aspects of a candle that we overlooked but had to add it after further discussion is the wick. Have you ever burned a candle and had the awful problem of the wick falling into the wax and then the candle hardening with the wick in it? Maybe, you’ve had the issue of having a gigantic mushroom head in your candle jar and it burning awfully and having a lot of soot. Well, we understand how you feel! This is why we read hundreds of reviews when it came to many of the quality candles on this list to ensure that individuals never had this problem. Now, when it comes to a mushroom head it all depends on the wick. The highest quality wicks are made from 100% cotton, which we shared a couple candle manufacturers that produce them with such quality. This avoids any potential gigantic mushroom heads and it allows for a much cleaner soot-free burn around your home. With that in mind, in the case that you do encounter a mushroom head candle, always cut off the mushroom head top before using the candle again. With that in mind, the strength of the wick will also determine how fast it melts and how the scent is released into the environment. This is what we discovered when it came to scent strength. As far as scent strength or intention was to share and showcase the best candles that are perfectly designed for a powerful and strong scent that individuals will enjoy. With that in mind, we can say that most of the scents on this list are expertly designed and crafted for individuals that want a beautiful smelling scent around the house. As we said earlier, the scent is really determined by the essential oils that the brand is using. Therefore, the strong the essential out, the stronger the scent. Another aspect we took into consideration when sharing the top candle scents is that the blend of scents that a brand uses. With a delicious quality blend, individuals can expect that they will receive a delicious medley that will last for days in a home. So, how many options of candles are there? As the next criteria that we took into consideration, one important factor that we wanted to touch upon is the variety of options that brands offer. Some brands offered only a couple, while many offer a plethora of candles that can last for months. As one of the most important criteria that we took into consideration, we wanted to make sure that we shared a wide variety of candles that individuals would enjoy. 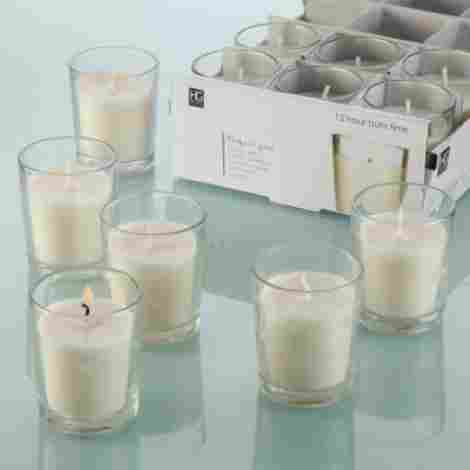 With that in mind, we also wanted the opportunity to share a wide variety of candles from the same brand in the case that an individual enjoyed that particular brand’s scent and style. With that said, another important aspect that we took into consideration is the jar design. As another important criterion that we wanted to consider, the jar design was one of the last ones that we really took into account. The reality is that most brands have regular candle jars that once an individual burns the candle, the jar is no longer useful unless it’s for crafts or stuff around the house. However, many brands today have gotten really creative when it comes to the jar design and what individuals can expect. For example, some jars are made from a mason jar design, so individuals can use the mason jar when it is done. Some candles are even made from a stemless wine glass so individuals can use the candle afterward. With that in mind, we can say that all of the candles on this list are designed from some of the most beautiful jars that users will find beautiful to display and share with friends. As one of the most important criteria that we take into consideration, we are eager to talk about the cost and the value that an individual can expect for a quality candle. If you are a new candle shopper, some of the prices above may seem like they are a bit expensive. However, they are of the best quality and produce beautiful scents. With that said, individuals can expect some of the most beautiful and worthy candle scents and designs. For the prices, we believe they are the premiere and quality candles that can withstand the test of time. As the last criteria that we took into consideration, we did not add this one until later on after we realized that many of the candles are designed beautifully. With that said, as one of the most important factors to consider, we realized that many candle brands offer the candle as a gift with a beautiful gift box design that does not need to be wrapped. Now, as far as the candle, many brands showcase the quality of their candles by the label and the gift box. In fact, the labels are of the best quality and look beautiful as décor as well as perfect as a gift. Lastly, the candle jars are designed as high-quality jars that are very appealing and can match with any décor. Now that we have covered the criteria that we used to decide on the top ten best candles, we want to share the frequently asked questions that users are asking about when it comes to quality candles. Q: What is the burn time? A: As the first most frequently asked question, we can see why no individual wants a poor burning candle. The burn time for most of the candles that we shared range from thirty hours to fifty hours. With that said, there are some high-quality candles that are manufactured to last up to sixty hours. With that in mind, individuals should expect a clean smelling and burning candle. Q: Can I reuse the jar? A: As the next frequently asked question, individuals want to know if they are able to reuse the jar. With that said, many of the candles that we have shared with our audience are made from high-quality reusable jars that are very appealing and can even be used as décor. Q: Does the candle soot? A: As another one of the most frequently asked questions, many individuals wonder if the candle soots. With that said, a candle soots depending on the strength of the wick as well as the material. With that said, we highly recommend that individual trim the wick before lighting again to avoid any soot from being released. Q: Is the candle safe for pets? A: When it comes to pet lovers that also love candles. One important aspect that individuals are asking is if the candle is safe enough for pets. With that said, consumers should always read the description of the candle to make sure that it is dye-free, paraffin free, and allergen free. In this case, many of the candles that we shared are safe for pets and individuals will enjoy the quaThe lity of the candle.